Thrivent has generously made the offer to cover the transaction processing fees so that 100% of your donation amount goes to First Lutheran. First Lutheran Church’s purpose is to proclaim God’s word to the community through worship, Sunday School, Adult Bible Study and community involvement. This includes a radio worship service on Sunday mornings. This congregation also provides pastoral care for our members and others in the community. Thank you for your donation. Please Click the image below to connect to a secure web page where you can make your donation. The donation page is operated by inFaith Community Foundation. They will take in the donation, Thrivent pays the processing fees, and 100% of your donation then goes to First Lutheran. You may also call us for other ways to donate. 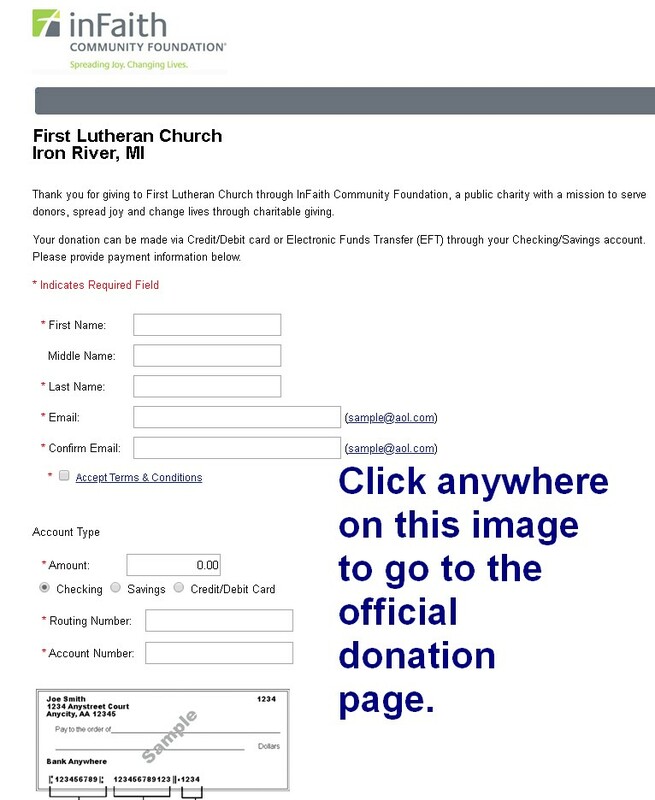 Please Click the image below to start your online donation to First Lutheran.